WICKER PARK — In March, Eskell will be leaving Milwaukee Avenue's shopping strip in Wicker Park — but fans of the popular women's boutique and home goods shop can take comfort in the fact the mainstay is moving just one "L" stop away, to Bucktown's Western Avenue. Located at 1509 N. Milwaukee Ave., Eskell, a hybrid of the owners' first names, opened in 2005. 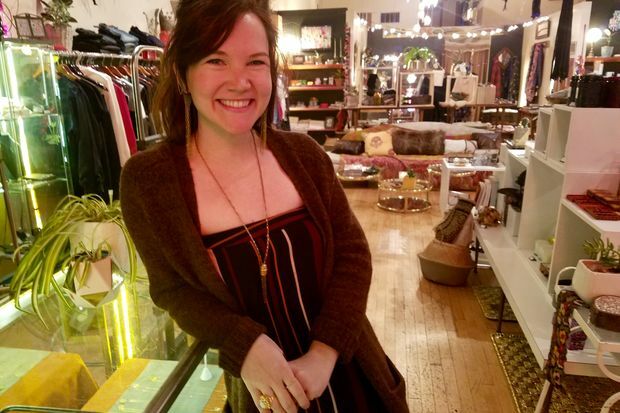 Owner Kelly Whitesell, who started the boutique with her best friend and fellow Indiana native Elizabeth Del Castillo, has run Eskell solo since 2011 with the help of her small team. Eskell's relocation to 2029 N. Western Ave. was announced via a sign in the window, which encourages shoppers to stay up-to-date by joining the store's mailing list at www.eskell.com. Carlee Nestelberger, an in-house designer for Eskell's line of jewelry, was in the shop on Sunday night. Nestelberger said the store's lease is up at the end of February. Nestelberger said that the new location, in a former muffler and brake repair shop next to Ipsento Coffee's original cafe and less than a block north of the CTA Blue Line Western "L" station, is larger than the Milwaukee Avenue store and will offer parking for customers. The Western Avenue Eskell will focus more on home goods, furniture and jewelry than on clothing, Nestelberger said. Early Monday, the building's owner and Eskell landlord Timothy Glascott could not immediately be reached for comment on Eskell's departure, nor could Whitesell. On "Cyber Monday," online shoppers using the code "ilovechicago" can get 30 percent off, according to the shop's Instagram. Let the cyber Monday madness begin! Use this code at checkout on our website & get 30% off your purchase. Go get after it! Thanks for supporting Eskell! !